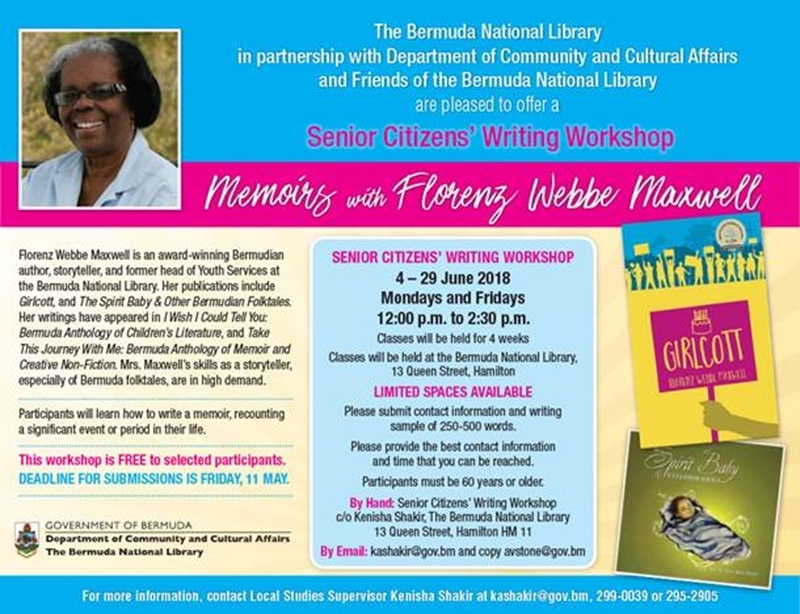 The Bermuda National Library, in partnership with the Department of Community and Cultural Affairs and Friends of the Bermuda National Library, are going to offer a Senior Citizen’s Writing Workshop titled ‘Memoirs with Florenz Webbe Maxwell’ from June 4 to June 29. The workshop will be held on Mondays and Fridays from 12.00pm to 2.30pm at the Bermuda National Library at 13 Queen Street in Hamilton. The event flyer says, “Florenz Webbe Maxwell is an award-winning Bermudian author, storyteller, and former head of Youth Services at the Bermuda National Library. Her publications include Girlcott, and The Spirit Baby & Other Bermudian Folktales. “Her writings have appeared in I Wish I Could Tell You: Bermuda Anthology of Children’s Literature, and Take This Journey With Me: Bermuda Anthology of Memoir and Creative Non-Fiction. Mrs. Maxwell’s skills as a storyteller, especially of Bermuda folktales, are in high demand. “Participants will learn how to write a memoir, recounting a significant event or period in their life. This workshop is free to selected participants. Deadline for submissions is Friday, 11 May. “Limited spaces available. Please submit contact information and writing sample of 25-500 words. Please provide the best contact information and time that you can be reached. “Participants must be 60 years or older. By hand the writings can be dropped at Senior Citizen’s Writing Workshop, c/o Kenisha Shakir, The Bermuda National Library, 13, Queen Street, Hamilton HM 11, or by email to kashakir@gov.bm and copy avstone@gov.bm.